The Guardian Legend NES review by SNESdrunk. Video. Thanks to channels like this the game did not went to abyss yet. And new players have a chance to know about this NES gem. It probably deserves to be in top-10 NES games. Today I would like to share a video from our member zfunk007 AKA Aggro Sky in our discord chat. It is full playthough in TGL mode with zero death. But the main reason I share this is the first 2.5 minutes. It has very nice intro. It’s like a mini review of the game. The Guardian Legend best speedrun? If you looking for the gameplay tactics then this can be good guide. Also you might see some tricks. Like skiping the transform animation by holding select. He dies to get back to some point faster. Well, just like the original version, you will be given all the items if you have a certain amount of money (or score… I don’t know), just the same as the original one, except that you will have all the weapon earlier than the original one. There are a lot of differences in this version and the original one. Optomon sure modified a lot of things here such as the map, the bosses (green Fleepa, orange Zib Zub, blue & red Teramute, green Eyegore, Green Grimgrin, Orange Optomon, Green IT – which used to to be the final boss of the original version, Orange Clawbot, Orange Bombarder), and also he add some big bosses as mini-bosses (there’s only one in the original version) to increase the difficulty. The best mini-boss in this version are probably the Red Optomon and Red Grimgrin. All the way to remove all the 10 seals are totally different (except for the 1st one). The repeated weapon and items were replaced with Blue Lander or Red Lander, the shop (buy 1 of 3 items) will be harder to buy, the Corridor 21 background is different, the musics in Area 5 and Area 9 are changed, the background of the Boss Rush (Corridor 21) is different but I prefer this one more than the desert theme, and finally the different final boss : 3 Gliders with one blue, one orange and one red which will be activated by defeating the 1st 2 gliders. This final boss is much difficult than the original one. Be patient, make your way to dodge their pattern, the missiles are the big threats in this case. Can you believe that 3 gliders are the final boss in this game which make a lot of gamers have difficulty in beating the game? 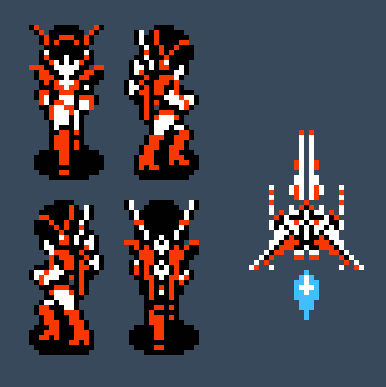 Probably yes, the red one moves like a berserker and release 2 red missiles which is hard to dodge. The longest boss is the Orange Bombarder, which took me about 5 mins to defeat. By the preferences of Dude Quest. A pretty sweet list of top ten SHMUPs of all time is actually are favorites by this guy. But the list is great for sure and it has the game by Compile mentioned. If you did not know Compile developed The Guardian Legend. That’s why there are some similarities in the Space Megaforce. We have a video share section in the community forum. It dedicated to the original game – The Guardian Legend. I think maybe to change it so it would be about other games as well? Memebers do like many other games besides TGL. So it might be a good thing to share other games too. Also it might attract the other people who never played TGL. Should it be dedicated to some specific range of games? Like SHMUPs and adventures, NES, retro stuff? I don’t really know 🙂 But if some good content I would put it here on front page sometimes. Let me share some video for you. It is some random playable mockup of the prequel. As the author said it is like a training program on earth where Miria trains to battle inside of simulation. I guess it is stopped at there and will never be continued. But worth a look. You may try to ask the author to share it as is. He only uploaded the video and never gave it to play.